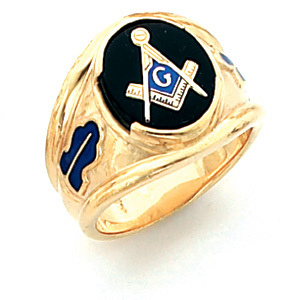 Yellow gold plated sterling silver larrge masonic ring has an oval stone and blue enamel side emblems. Choose red, blue or black onyx oval stone. Blue Lodge set square and compass logo. Plumb bob and trowel enamel side emblems. Solid back. Made in the USA. This item ships to the United States, Canada, Australia, Japan, United Kingdom and Germany.